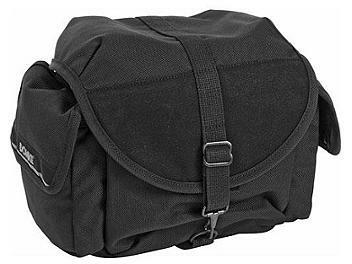 The Domke F-3X Super Compact Ballistic series bag is a 1050 Denier ballistic nylon bag made to carry 1 or 2 film or digital SLR cameras with 3-4 lenses and accessories .It features nine compartments and pockets including a removable padded partition wall. An adjustable non-slip Gripper Strap runs completely around the bag. The bag has an open cell foam liner in bottom adds cushioned support. It comes with a removable hand carrying strap which can be used whether bag is open or closed.